This contest is always the big one of the year and attracts the most operators for the effort. There were a number of tasks to complete before the contest. Lee and Gary organized a team work day to organize the 80M and 40M loop antennas a few weeks prior. Attention to detail paid off and the complete antenna system was ready to go when the team arrived. 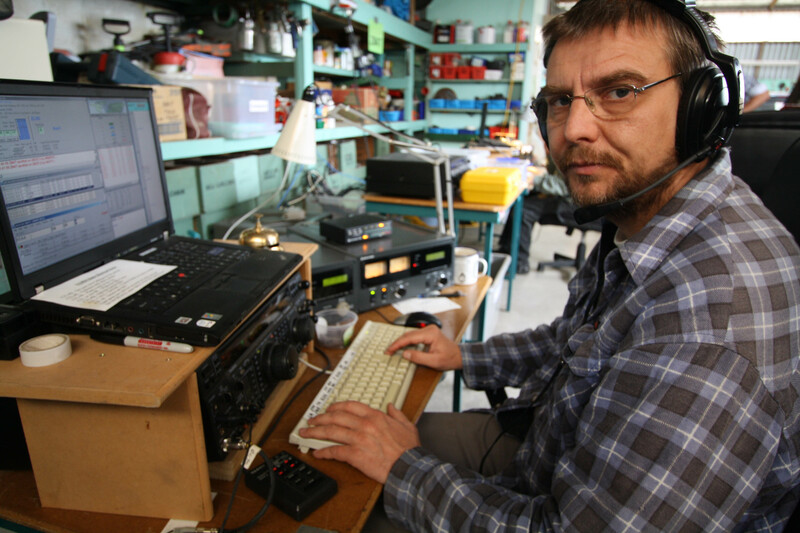 Operating positions, radios and computers were set up the day before the contest. The coax junction distribution box is now permanently positioned at the rear of the operating positions and it is so easy to connect the permanent runs of coax between the antennas and the shack for the primary four antennas. We have always had a question of whether the full wave loop or the full size quarter wave vertical is the better choice for 80M and 40M. Holger is a fan of the verticals and with a few contests we have proved there is little difference in actual operation. In fact the verticals may have the edge and seem to be used more. It is a luxury to be able to switch between the two antennas. The 40M vertical on top of the shack roof with the huge metal roof ground plane is amazing for what it does. Still, a project for the future is a 2 el yagi of some sort on 40M although Gary is leaning towards a 4 Square on the roof. 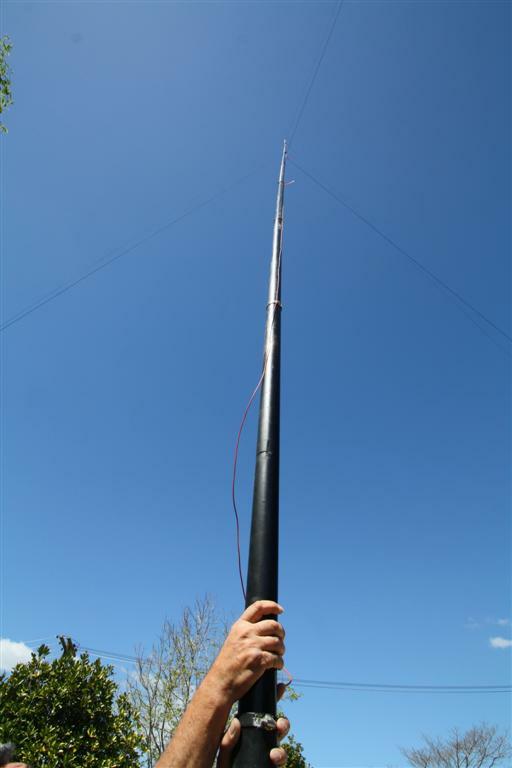 Holger ZL3IO’s 80M quarter wave Spider Pole vertical with only two radials also works very well and enables us to operate 80M effectively. He manages to erect the antenna in about a half and hour. It is very effective on this band. A problem which has plagued us is the poor internet operation we have had into the metal clad shack. We have tried Wi-Fi LANs and also a USB Vodem to access cellphone coverage with mixed success. DX Cluster “dropout” when operating is frustrating. Wayne ZL2WG donated some CAT 6 cable and we now have a direct wire link into the shack. It works perfectly to tie into our Ethernet system and N1MM on the screens while operating. Saturday morning saw the team assemble for the usual pre-contest meeting. This year the emphasis was on accuracy as the contest judges will be harsh if any team steps out of line and we did not want to have our hard earned score devastated by errors. We also talked about better operating with more disciplined practices. We all are guilty of being less professional than we could be so that every last second counts. We all agreed that improvement was need and a set of written guidelines was tabled. Then the unexpected happened and from time to time we all slipped back into “Useless Op” mode. The rest of the team were always listening and a few notes were handed to the errant operator with great gales of laughter. It happened to several of us and made us realize the contest operating is not as easy as it looks and the op at the coalface needs to get rid of superfluous and silly expressions which waste time. Did the strategy work? We all noticed an improvement in our individual styles and as a result, the team improved it’s overall result this year. A few seconds shaved off each QSO allows another QSO to be squeezed in the same time. Stan ZL2ST is a master at producing statistics on past contacts. He pointed out that we should be setting targets and tracking progress on last year’s charts. Stan has historical hourly charts, band charts and others which are of great help to make decisions such as when to rotate antennas and where to aim them. 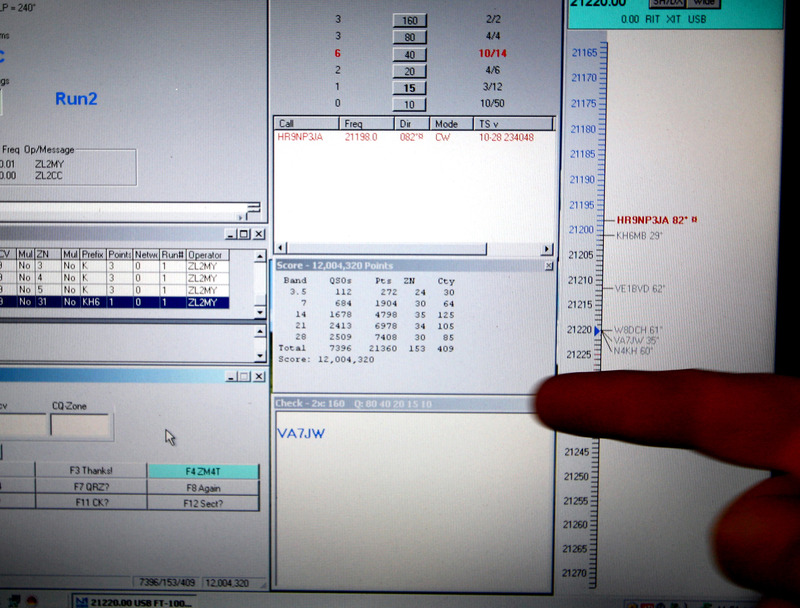 Lee ZL2AL produced the operator shift charts to select individual operator’s times. 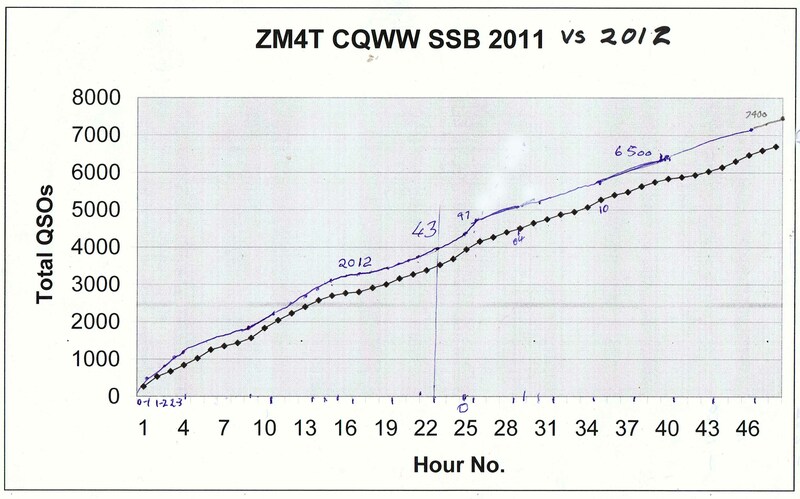 After a cuppa we were into the 2012 CQWW SSB at 0000 UTC. We opened up on 10M and 15M as the start of our contest is mid day daylight in ZL. Both bands were running hot during the afternoon and our tracking showed that we were slowly pulling away from our 2011 effort. A few hours later and we were 300 QSOs up on last year. 2012 was shaping up to be a great year. The progression continued and by the end of the contest we were showing a raw score of 12,004,320. Errors, dupes, fatigued ops and the CQWW Judges will no doubt, reduce that score by several percent. It will still be out best effort to date. What was gratifying was the increased multipliers and significantly better QSO numbers on all bands. Holger rightly points out that multipliers are the key to high scores. Sometimes you have to smile in wonder at how Murphy will strike! 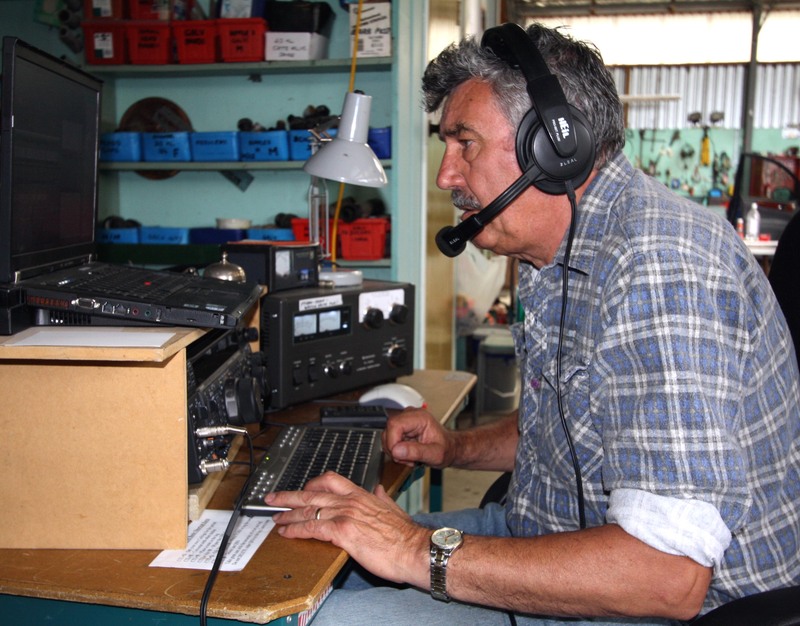 Mike ZL2CC recounts this story during the contest……. I spent over a hour trying to work up a pile-up with only 5 contacts logged. AND one of those was a dupe! I had tried to work a multiplier and was concerned that I had heard two ZL’s work him yet I couldn’t. Gary ZL2iFB was on next and as Gary took over, Mike ZL2MY, went to reset the antenna as I couldn’t work that area. Almost immediately Gary worked the multiplier and had a pile-up going. Bugga, I thought. It happens……then Mike returned to say that the antenna was actually 180 degrees out. It was pointing in the wrong way by 180 degrees. I would love to know who ‘set me up’ hi. 2 x FT1000MPs. 1 x TL-922 amplifier. 1 x Tokyo Hi-Power HL 2.5Fx amplifier. 10m: 4 element rebuilt homebrew Yagi about 13m up (hand rotated) now with a 1:1 SWR! N1MM Screenshot at the end of the contest. Our best score ever! The last few hours of the were slow as we seemed to have shovelled out the bands. The end of the contest showed a raw score of 7396 QSOs, 12,004,320 million points and 153 Zone multipliers, well up on last year’s effort. We are well positioned for the next big contest on our calendar: CQWW CW at the end of November. This entry was posted in ZM4T Contests by Lee. Bookmark the permalink.